Do you like reading about various conspiracy theories? Are you well versed in what is good for you to eat and what isn't? Do you know why at one time butter was no good for you--but now margarine is no good? Eggs are another one that has gone back and forth. I have personally never trusted the FDA (Food & Drug Administration)-they have changed their tune once too often over my life time. At this point if they say something is bad for you I assume rightly or wrongly it is NOT bad for you and they will reverse their "findings" in a couple of years. If you are interested in what goes into your bodies and the bodies of your families you really should read this book-it is relatively short but with so many references it may make your head spin. Take what you read with a grain of salt--but do your own research-so very much in here is true! Ever wonder why the world's food supply is controlled by a handful of people? Or wonder why American pharmaceuticals are so expensive? Curious about GMOs or black label warnings? This book is an ode to those who suspect something sinister about the quasi-monopolies of the world's food and drug corporations. Is this another layer to New World Order advancement? 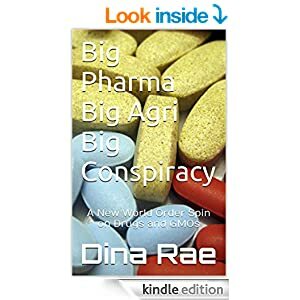 Big Pharma, Big Agri, Big Conspiracy is a collection of legitimate research that might make you think twice about crackpot conspiracies. Her second novel, The Last Degree, is a fictionalized account of the Freemason’s role in the New World Order. Dina's grandfather was the Most Worshipful of his lodge. The subject has always held a personal interest. I received an e-book for review purposes. All opinions expressed are my own honest opinions. For more information please check my Disclosure Statement. Our giveaways are in no way sponsored or promoted by Facebook. This sounds like an interesting read. I am always a bit distrustful of big anything (government, business, whatever). Thanks for the review. Wow. Sounds like something scary is going on. Must check this book out. what a topic!! I'm with you FDA changes their tune every other month!! Going more Organic when I can is my choice. This book does sound very interesting. It reminds me of Food Inc. I think the gov. has put finances before the public's health. Just look at the obesity rate in the US! It's all about cheap corn corn and soy crops and pumping high fructose corn syrup into the American Diet. Sounds very interesting. I'm always up for a good conspiracy theory! an interesting read by the sounds. Would be something I might try. This sounds like something all Americans need to read. I'm sure we don't even know half of what really goes into processed foods and drugs. I'm glad there's accountability in place, but I have to admit the 'accountability' makes me nervous too. Such a great topic, its scary that the FDA keeps changing things. My hubby is in the medical field so I just go with what he is comfortable with, especially for our kids. I am passing this on to him, he would enjoy reading it. I so agree! I don't trust big pharma as far as I can throw them. After meds were making me more sick and the dr kept upping the dose, I did my own research, ditched the pills, and basically made myself healthy again with paying attention to my own diet and exercise. I bet this is a fascinating read! I'm thankful that, like Jenn, my hubby is in the medical field. We are blessed to have that knowledge! Makes sense, seems everyone is out for themselves. Especially in big business and government. Conspiracy theories are something that has always intrigued me.. The What if always has me thinking.. I know quite a few people who would want to read this. This is a very hot topic right now. This would a book for my hubby, he loves this type of discussions. He is all about conspiracy theories so this would be more for him to read than me. I love reading stuff like this - definitely going to have to check it out! This sounds like the type of book I might be interested in. Very conrtoversial topic. hmnn very very interesting! i enjoy books like this that offer more than what meets the eye. thank you for sharing!